How to paste the data in the current cell when the ListBoxSelectionMode is enabled? In the GridControl, pasting the data in the current cell when the ListBoxSelectionMode is enabled is achieved by handling the ClipboardCanPaste event. By using this event, you can get the Clipboard text by accessing the GetData()of the GetDataObject() method. 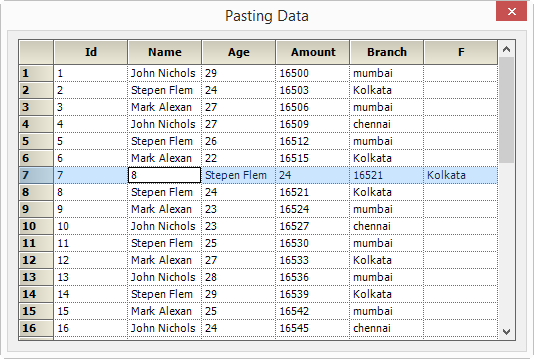 Then the data can be pasted in the current cell by using the PasteTextFromBuffer method. The following screenshot displays the data pasted when the LisBoxSelectionMode is enabled.